The Trans Pacific Partnership effectively died with the election of U.S. President Donald Trump, who wasted no time in announcing that the U.S. would not move forward with the agreement. Since the TPP cannot legally take effect without U.S. ratification, the decision to withdraw effectively kills the deal. The remaining TPP countries will meet in Chile next week to discuss what comes next. 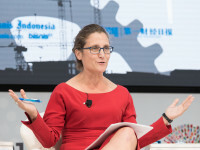 In advance of that meeting, Foreign Affairs Minister Chrystia Freeland appeared before the Senate on Tuesday and was specifically asked by Senator Joseph Day about the possibility of trying to salvage the agreement.